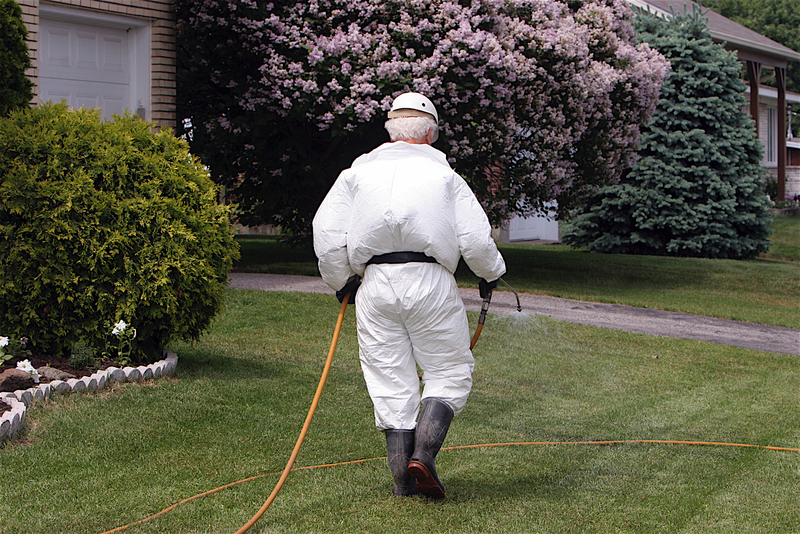 The lawn-care technician in the photo above is dressed for hazardous duty, and for good reason. If you do nothing more than ban the use of pesticides in your yard, you’ll have done a very good thing for wildlife and pets, alike, the atmosphere and, not insignificantly, your own health. The term “pesticide” includes herbicides, insecticides, rodenticides and numerous other -cides, all intended to kill or incapacitate. If you’ve been using them and haven’t considered how hazardous they are, just look at the warnings given by the Environmental Protection Agency. The EPA defines a pesticide as any substance used to “prevent, destroy, repel, or mitigate” any pest. The EPA warns us to use impermeable gloves, long pants and long-sleeved shirts when using pesticides. Furthermore, we’re not to use pesticides on windy days, around children or their toys, around pets, a pool, or the garden. We should cover food. And we should keep the products locked away from youngsters and teach them that pesticides are poisonous. Pesticides, they say, can poison through inhalation, tissue absorption or ingestion. Even if we were to assume the EPA was being overly cautious, the warning labels on the product containers themselves shout “Danger” front and back. These products have no place in our lives, nor in a backyard wildlife habitat. Many pesticides are organophosphate pesticides or n-methyl carbamates. The important thing to know about them is they originally derived from World War II chemical warfare agents. They kill by breaking down certain nerve impulses, leading at last to irreversible physiological damage. If you were to become poisoned by one of these chemicals, you would experience nausea, vomiting, heavy salivation and drooling. You would wheeze and have difficulty breathing. You would begin to have seizures, then lapse into a coma and finally die. Even mild poisoning can cause muted variations of these symptoms and most of the time the symptoms are not recognized as being connected to the use of a pesticide. Killing pests won’t solve a pest problem, anyway. More pests soon fill the void and more pesticides are then needed. The best way to deal with pests is through non-chemical means or by using natural repellents. For example, to discourage rabbits you can broadcast blood meal on the ground around plants, fence off precious plants or even plant enough to share with them. Hose undesirable insects off your plants or, better yet, make your yard an inviting host to their natural enemies. Pigeons can be discouraged with roof spikes. To keep mice, rats, termites and other insects away don’t stack firewood or debris beside your house foundation. Every year as many as 60-70 million birds die from pesticides. It’s a staggering number, but considered by some researchers to be a conservative estimate. And, get this: most of it is unintended. How could this happen? Like this: Birds ingest residue when preening their feathers, they drink contaminated water, eat contaminated prey, mistake pesticide granules for seeds (a single granule of some pesticides is lethal to them), absorb them through their skin or inhale them. At least 40 active ingredients in pesticides kill birds. It isn’t just birds that suffer. Pesticides drift. Fine particles ride the wind and strike non-targeted species, including humans. All wildlife may be harmed by even trace amounts of some pesticides. Poorly timed or careless spraying of insecticides may kill insects you don’t wish to harm, like honeybees and other pollinators of your flowers.You may intend to eradicate only the aphids on your red milkweed plants, but unless applied very carefully, even a slight bit of wind will carry the poison to other plants. Not only that, but all insects on the milkweeds will die, including any Monarch butterfly caterpillars caught in the spray. Insects on nearby plants may be killed, too. Until it breaks down, which can be as quickly as 24 hours or as long as many years, the product will kill all unlucky insects who crawl on, land on or brush against those plants. Herbicides, too, can have unintended consequences when they drift and damage neighboring plants and flowers. Then there are the rodenticides, which are formulated to be tasty, and won’t just kill mice and rats, they can also kill other mammals, including your pets. Some outside pests inevitably manage to get inside your house. Like pesticides, they ride in or blow in, or they crawl in through what seems like impossibly small holes and cracks in your walls and foundation, or they may just march in through open doors and windows, like General Sherman taking Atlanta. Whichever, a typical response is to swat, stomp or spray them to death. But, there’s a safe alternative to this: catch and release outdoors. Pesticide use indoors is a vicious cycle. It kills but does not stop new pests from entering. If only we could post a sign at all entrances in pest language warning that death awaits within, wouldn’t this be so much easier? Instead, these unwelcome guests continue to find their way inside where insecticides will kill them, but only until the toxicity of the product breaks down. Then the spray must be reapplied and the cycle begins again. We all know this from our own experience with losing this battle. Have you ever sprayed insecticides in your house just once and never seen another insect? While the pests are dying, you and your family are repeatedly exposed to these chemicals. In the U.S., about one of every 16 calls to poison control centers every year is because of pesticide poisoning and death. Reports indicate pesticides have been responsible for chronic health problems that include neurological disorders, cancer, reproductive difficulties and impaired infant development. Worldwide, every year 220,000 people die from pesticide poisoning. Children are especially at risk. Tests on animals have shown that pesticides attack the developing brain, leading to lifelong behavioral problems. A comparison study of preschool children in a farming community that used pesticides and another that did not reveals striking differences. The children in the pesticide community had impaired hand-eye coordination, less physical stamina, short-term memory problems, and difficulty drawing. They also were more aggressive and anti-social compared to children in the other community. There are at least 101 common pesticides that are known to be probable human carcinogens, and some are known carcinogens that increase the risk of several forms of cancer. At least five studies have found a link between mothers who used pesticides while pregnant or nursing and their children who developed acute leukemia. Insecticide and herbicide use is also linked to disruptions in hormonal function, birth defects, stillbirths and neonatal deaths. Pesticides are in foods and Food and Drug Administration data shows that between 33 and 39 percent of foods contain pesticides when you take them home from the grocery store. Pesticides are probably in your drinking water if you live in an agricultural community that uses surface water for its water supply or has poorly protected wells. They were put there by chemical runoff. Even if you don’t use pesticides indoors, these poisons will invite themselves inside when you use them outdoors. Pesticide particulates ride in on the gentlest breeze through open doors and windows, they hitch a ride on your clothes and cling to your shoes. They’re transported inside in your dog’s hair and on the flower bouquets you pick from your garden. They’re on your children’s toys. They circulate throughout your house through the ventilation system and accumulate at high concentrations near the floor where your pets and toddlers play. They drop to your countertops and coat your furniture. Even the dust in your house will collect pesticide particulates. Inside, remove what attracts pests, like sources of food and water. Clean up food spills immediately with soap and water, vacuum regularly, seal food containers tightly, and seal all cracks and openings around the foundation to prevent access. We may not be able to protect the rest of the world from pesticide overuse, but as masters of our own domain, we should do our best to live pesticide-free, both outside and inside.